Think of this hike as a high desert jungle with a built in bird sanctuary. You will have to put in a 1.5 miles of open trail work to get to the best parts of this trail but it is well worth it. This trail does provide refuge from the heat once you move past the 2-mile mark. After the 2-mile mark you are rewarded with a wide array of high canopied trees (cypress, ponderosa, juniper, alligator juniper) and shaded trail with glimpses of red rocks as you go up down and through several arroyos. Note: because of ample shade/moisture, it is recommended you bring a little bug spray, especially in April and May. 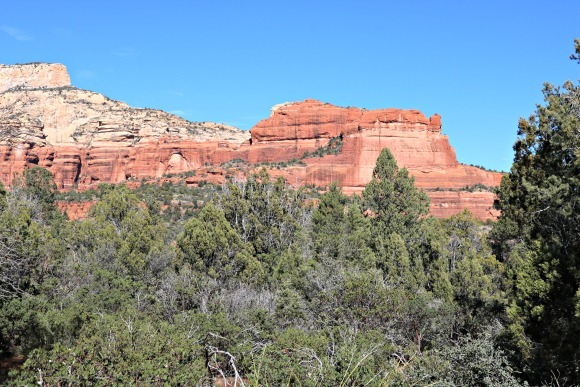 Long Canyon Trail is a 7.2 mile moderately trafficked out and back trail located near Sedona, Arizona that offers scenic views and is good for all skill levels. The trail is primarily used for hiking, nature trips, and horses and is accessible year-round. Dogs and horses are also able to use this trail. This is a nice 7 mile round trip moderate hike through a forest with red rock views. The first 3/4 mile is not shaded and can be very hot in the summer. But once you are in the forest, the shade helps offset the summer heat. With all the growth, it’s sometimes difficult to take the photo you want to. You intersect the Deadman Pass trail about 1 mile in. We hike Long Canyon about 3 .5 miles but you can go further. The trail becomes steeper, however. If you’ve ever hiked in the Grand Canyon or Sycamore Canyon or Aravaipa Canyon, Long Canyon won’t strike you as all that long. And its eponymous hike is even shorter. It’s only 6 miles round-trip, with no significant elevation change. That means it’s easy, and unlike those other marquee canyons, this one can be explored on a whim, without a lot of prep work — no training hikes, no topographic maps to study, no power diets. All you have to do is roll out of bed and hop in the car. The trail begins just off the paved road that leads to the luxurious Enchantment Resort. But don’t let the neighborhood give you the wrong idea. This is a wilderness hike, and all signs of civilization disappear quickly, leaving you alone with a contingent of Sedona’s iconic red rocks, including Wilson Mountain, Maroon Mountain, Steamboat Rock, and a number of unnamed cliffs, spires, windows and arches. As you might expect, the panoramas are spectacular. You’ll see that firsthand within the first few minutes of the hike. You’ll also see manzanitas and junipers along the path, which is red dirt and easy to follow. After about 5 minutes, you’ll come to an old jeep road. Turn right, hike another 30 yards, and follow the trail to the left. This stretch can be a little confusing, but a few minutes later, you’ll come to a sign that confirms you’re on the Long Canyon Trail — there’s no signage at the trailhead. About 15 minutes later, after passing an intersection with the Deadmans Pass Trail, you’ll arrive at the boundary of the Red Rock-Secret Mountain Wilderness. All wilderness areas are special, but this is one of the crown jewels. Within its 43,950 acres, you’ll find everything from banana yuccas, agaves and junipers to cottonwoods, bigtooth maples and ponderosas. Badgers, bobcats, mule deer and mountain lions are in there, as well, along with ravens, red-tailed hawks, Steller’s jays and a litany of other plants and animals. And, of course, the red rocks. Just beyond the wilderness boundary, the trail dips into a small wash, on the other side of which the trees start getting taller. At the 45-minute mark, you’ll see your first ponderosa, which is surrounded by a cluster of alligator junipers. Big gators. From there, the trail winds through a small drainage. The drainage is usually dry, but it still supports a community of water-loving vegetation, including a number of Arizona cypress trees, which are easily recognized by their shaggy bark and round, gum-ball-sized seeds. As the elevation climbs, oaks and other deciduous trees start showing up. The trail is well shaded along this stretch. That’s not a selling point in January, but other times of year, it’s a relief. The topography remains about the same for the rest of the route, although, the walls start closing in and the ponderosas start getting bigger. The vegetation gets thicker, too, and the cairns start to pile up. Technically, even cairns are a violation of the Leave No Trace principles, but in the interest of “safety first,” they do come in handy. As a general rule, be religious about what’s best for Mother Nature, and respect the utopian ideals of our wilderness areas. The trail ends after 90 minutes at a sandstone wall where there are a few small Indian ruins and some primitive pictographs. If you’re lucky enough to find them, leave them alone — it’s illegal to disturb them. Instead, take a look around, enjoy the moment and the solitude, and then begin the short walk out of Long Canyon.